For the lovers of green lawns, flowers, sun and starry skies. For those visiting Florence and wanting to discover the city in an original and tasty way. For those who want to make a surprise, move, amaze… and maybe also pop the question! For those who want to make a present to their parents or to two special friends. 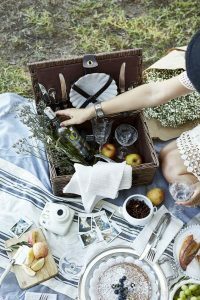 For all of you that… Le Pic Nic C’est Chic! The banks of the Arno river. Any romantic place in Florence you can think of! Choose the place and the time for the delivery of the basket. We will collect 2 hours later. + basket, flatware, blanket, cushions, flowers. + basket, flatware, blanket, cushions, flowers, candles, little sunshade umbrella and creativity.